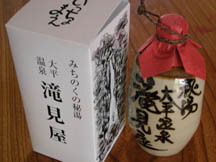 [Privilege] One person sticks like and a sake holder or one juice gives their service. [One day trip bathing] 500 yen, 8:00 to 17:00. It is an enough hidden hot spring to the valley bottom of the canyon which the best rapids minced deeply.The four quarters are sandwiched by the steep cliff and, otherwise, a size waterfall will not have an enough hidden spring in countless and a severe canyon like this.The only mountain trail attached to the cliff was come down, and that was felt strong.Although it is also slight that the sun shows up, a Mama-gawa-river ravine flows into west-northwest, and the afternoon sun is [ that of an enough ] help.When the fresh green which buds at a stretch in quest of few sunshine, and the red leaves which color all at once with a severe winter near at hand were brilliant, the husband taught them.It is said that it meets well also in an ape or an antelope.It looked at the long distance and the waterfall and went into the indoor hot spring, and when the cliff which sinks and presses the open-air bath of the best origin for the body was looked up at, the labor which establishes an inn here was remembered and it became one hot spring of appreciation.It is said that a local Takimiya-Ryokan predecessor will succeed management in Showa 13, and started the inn from the first.A Narimoto Taira year renewal, the isolated lodge of a wooden two-story building (3 stories of parts). "early summer rain is collected, and is already carried out, and it is the Mogami river ". Basho Matsuo "Narrow Road to the Deep North." 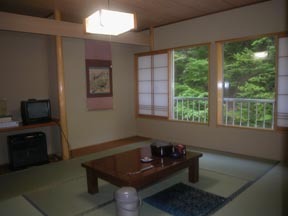 It is between a good location to see and a takimi about a Kaenno-taki. 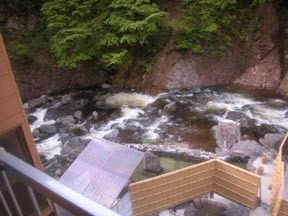 A male open-air bath and a "Mama-gawa river"
a souvenir -- the U.S. white distilled liquor -- pleasing . 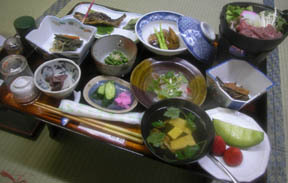 Wild grass and river fish, the Yonezawa district dish. Meal place: Every morning and evening large room. 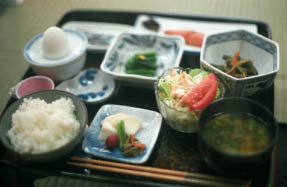 A handmade produced-in-the-district dish of wild plants and Yonezawa beaf were able to get very deliciously. 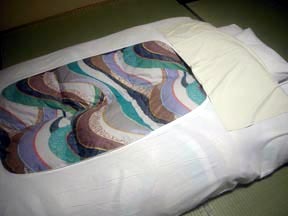 One-day-trip bathing: 500 yen, 8:00 to 17:00. * It is subject to change by natural conditions. 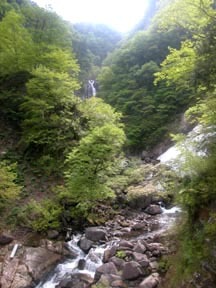 It is automatically cooled because the fountainhead of 63 degrees also draws hot spring water from the source a ravine, and the flower drift fountainhead of a white hot spring where hydrogen sulfide odor is also felt is hung in the pouring gate of an optimum temperature. Separated by gender.The object for women has eaves. 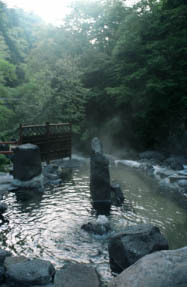 A chartered open-air bath is a reservation reception office at the time of one and check-in. 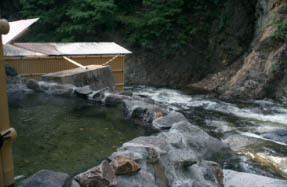 It is said that the chartered open-air bath of the bath structure of the summerhouse style established newly in the summer of 2004 was also crushed by the heavy snowfall of the year, and only the bathtub remained. Mail is :4266-7, Sumomoyama, Yonezawa-shi to an office. 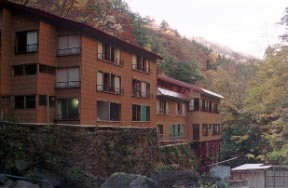 To the Yonezawa station, it is reservation required.